Director Jimmy Huston shot Final Exam over six weeks, utilizing a crew made up of his friends and students. Many of them also served as extras in the middling slasher film. Late at night, two college students (Carol Capka and Shannon Norfleet) are busy making out in a parked convertible. Ignoring the girl's frequent objections, her boyfriend pushes on. A sound outside...a shadowy madman jumps on top of the car, slicing his way through the fabric roof. Reaching inside, the lunatic grabs the young man and pulls him up and out onto the car's hood. Brandishing a blade, the killer stabs the poor man to death. Sleepy Lanier College is nearing the end of Final Exam week, a frenzied semester cap time of grades, goodbyes and pranks. As the students prepare for their tests as well as the coming vacation break, little do they suspect a psycho in a black van is stalking them one by one. Plain but amiable Courtney (Cecile Bagdadi) is completing her exams and studying hard. Averse to hitting the books, her roommate Lisa (DeAnna Robbins) is busy packing and getting back to the city. Meanwhile, Gamma Delta fraternity pledge Gary (Terry W. Farren) has pinned his girlfriend Janet (Sherry Willis-Birch)...and paid for it by being treed by his brothers, stripped to his briefs, awash in shaving cream and ice cubes shoved down his underwear. As night falls on Lanier, a freezing Gary hopes his beloved Janet will free him from his humiliation. Untied from the tree by an unknown figure, Gary breathes a sigh of relief...and is then stabbed to death on quadrangle lawn. Energetic but dim witted Gamma brother Wildman (Ralph Brown) is on the prowl for pain pills his frat can sell on the open market, a search that's led him to the darkened campus gymnasium. Having scored the booty, Wildman heads home. Soon enough, Mark (John Fallon) finds his buddy Wildman dead in the locker room, El Wildo's body stuffed inside a locker compartment. But the killer isn't far behind and chases Mark to the school's electrical building. Surprising Mark from inside an empty barrel, the slasher stabs the studen repeatedly. Radish (Joel S. Rice) is Lanier's uncontested nerd, a book smart twerp fascinated by serial killers, mass murderers...and Courtney. This night, as he sets about on a thorough inventory of the campus gym equipment, he discovers Mark's bloodied body and immediately calls the police. But due to ongoing pranks from the Gamma house, the authorities are disbelieving and unamused. Deciding to warn his secret love about the menacing stalker, Radish runs back to Courtney's dorm and straight to the girl's room...where the killer is waiting for the hapless geek. Returning to her studies after a Pepsi break, Courtney is surprised to find Radish's head sticking through her splintered door...and even more shocked to discover it isn't a joke. Frightened, Courtney tries to rouse help from a now abandoned dorm...indeed, the campus is desolate. Except for Lisa. Waiting for her lover Charlie in the conservatory, Lisa plays the piano and then decides to strip down and wait for beau au natural. The killer enters the room and stabs lovely Lisa to death. Courtney has now made her way to the conservatory and hears music from the piano room. But opening the door reveals the knife wielding killer; Courtney runs for her life straight to the cafeteria. There, she grabs a knife and tries to call the police. No luck. Using the automatic food chute, the killer locates Courtney in the kitchen. The poor girl briefly manages to lock the psycho in the kitchen storage room...but forgets to lock a second door. The chase continues. Outside in the quad, Courtney wanders frantically before finally seeking refuge in the campus tower. But the killer isn't far behind. Inside, the two climb story after story. Lanier's sports coach (Jerry Rushing) has arrived for a hunting date with campus security guard Mitch (R.C Nanney). Courtney screams for help from the tower window. 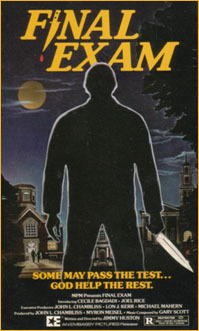 By any stretch of the imagination, Final Exam is not one of the stronger early '80s slashers. The pace of the first half is rather sluggish, the gore effects are minimal and the characters too cardboard - even for such formulaic stalk pics. But Exam does possess a certain charm. Once the murders start, they come quick and fast. Cecile Bagdadi is a likable enough heroine and to its credit, the narrative is pleasingly straightforward. The climax is confident and acceptably done.